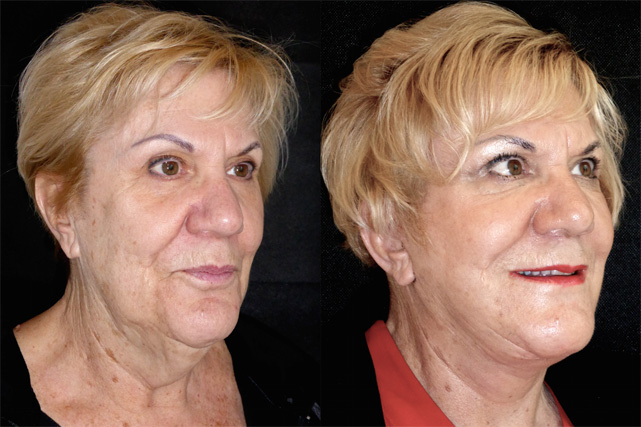 Colleen, 63 Facelift, necklift, Brow lift, Submental liposuction, Platysmaplasty. Colleen is an executive city high flyer and super granny who was recommend to me by another patient. 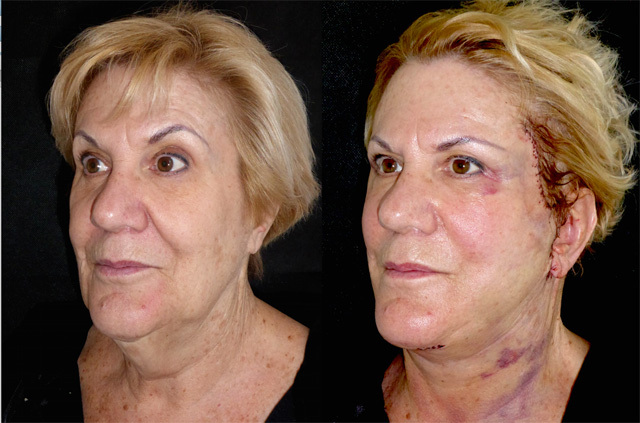 Her main concern was her lower face, neck skin excess and hooded upper lids. 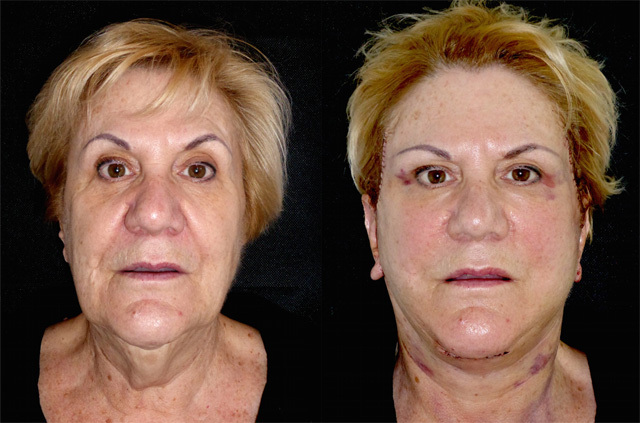 Her upper lid hooding was secondary to brow descent, not blepharoptosis (primary excess upper eyelid skin), so a lateral temporal brow lift would address her concerns. 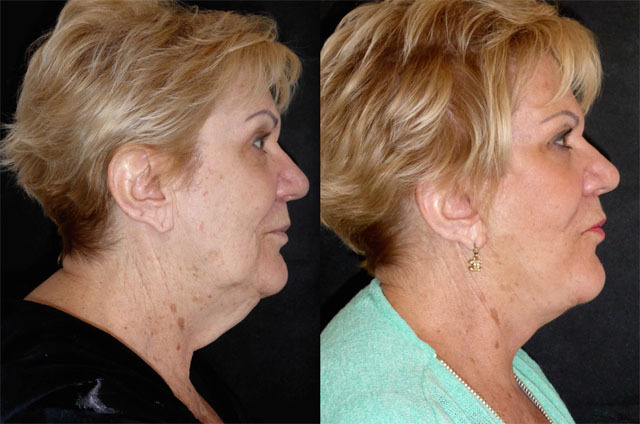 A full face and neck lift and rigorous submental liposuction would redefine her lower facial third and neck chin angle. 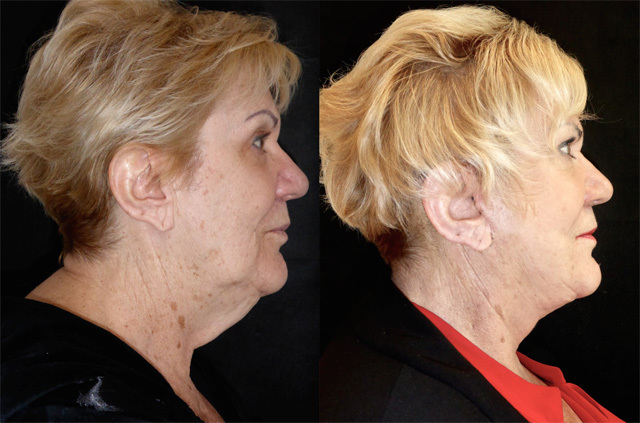 I also performed a small cut under the chin to remove further fat (sub mental lipectomy) and stitch the platysma muscle together (platysmaplasty) to really tighten that lower neck skin excess. The morning after Colleen has had a compete transformation. 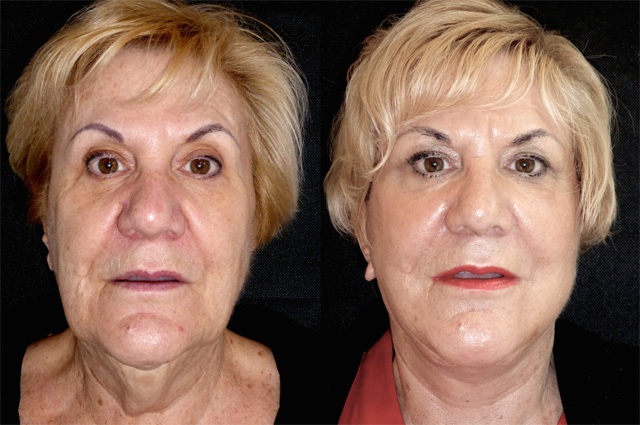 Her face shape is more slender, jowls and folds have been minimised, and her brow position is much more feminine. 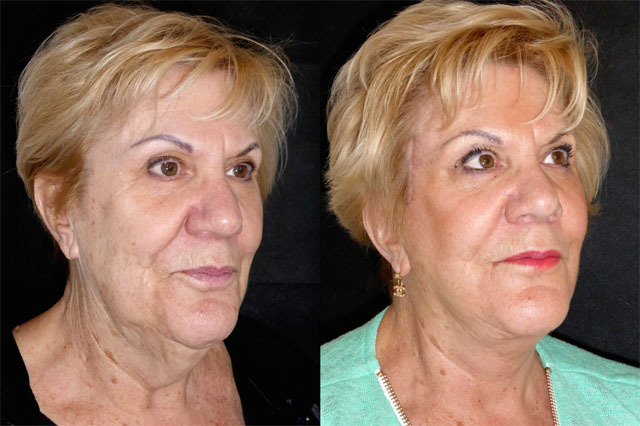 When the swelling settles - unavoidable with pan lower facial liposuction - she will look fantastic. On a side note, what an infectious fun loving person Colleen is, her surgery was so much fun, awake throughout, she joined in with the banter between Miles, Zdenka and myself throughout her surgery in-between blissfully snoozing through the twilight sedation. In her own words “it felt like a party in the there, one of the best afternoons I have ever had!" Here is Colleen at the one week review for removal of her stitches. She walked in with designer purchases, and why not combine a trip to Harley street with a spot of retail therapy on Oxford Street! She is doing brilliantly. Bruising is on its way out and her incisions healing perfectly. 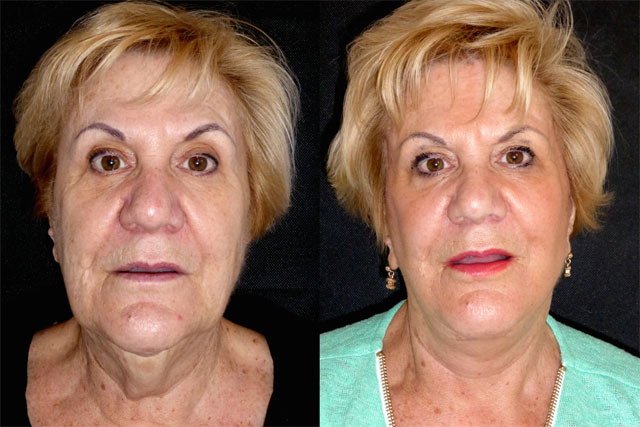 Her elevated browline is sweeps gently in the lateral third, mid face is volumous, and her jaw and neck line are completely transformed. I don’t normally routinely review my patients at this stage, but just as I was preparing to operate, I get an excited call from reception… I am told Colleen has popped in in between city meetings and looks amazing. WOW! what a transformation. 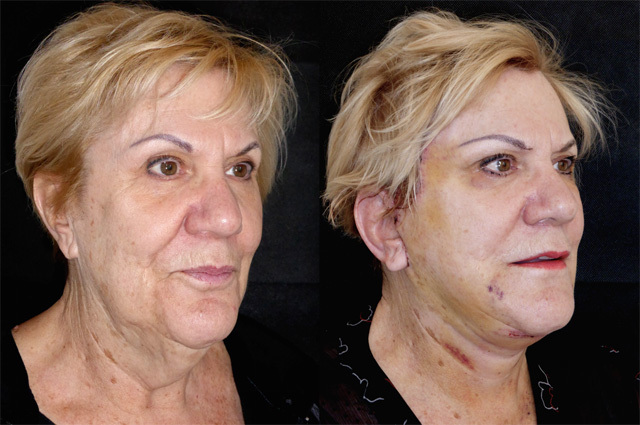 Only 12 days following significant facial surgery Colleen is looking sharp! New hairstyle, full designer suit and makeup. Her neck skin has contracted beautifully, wounds (they are barely scars yet…) inconspicuous and her face shape is much more defined. I love surprise visits from my patients! Here is Colleen 4 weeks after her surgery and looking fantastic. Yet again a patient comes for review wearing bright colours to reflect their newfound confidence! I can see a paper being written; The sartorial effect of facial plastic surgery! 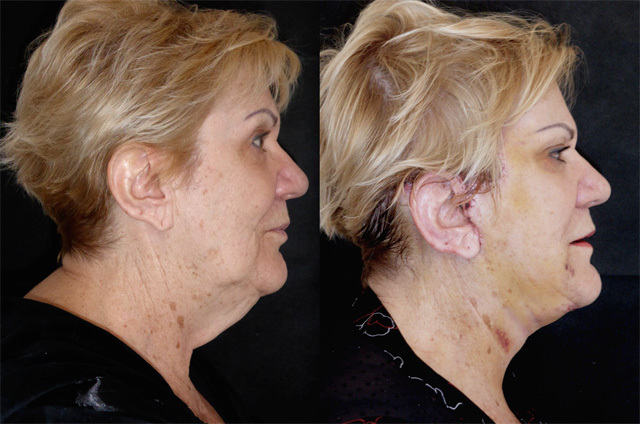 Colleen his healing beautifully, scars are flat and contracting now, her neck if much more defined and her cheeks are plump and youthful. 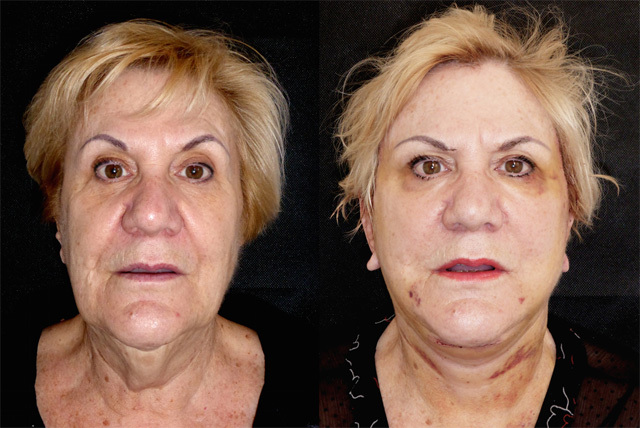 I’m really happy with her result, now to finish off the rejuvenation with some resurfacing and prescription skin care.